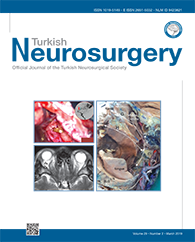 5University of Health Sciences, Sisli Hamidiye Etfal Training and Research Hospital, Department of Pathology, Istanbul, Turkey DOI : 10.5137/1019-5149.JTN.22633-18.2 AIM: To evaluate bevacizumab for epidural fibrosis (EF) treatment in an experimental rat model using histopathology as well as immunohistochemical staining for CD105 and osteopontin (OPN). MATERIAL and METHODS: Sixteen Wistar Albino rats underwent either laminectomy alone to induce EF (group I, control) or laminectomy plus local bevacizumab treatment (group II). The degree of EF was compared between groups using the current histopathological grading method as well as immunohistochemistry for CD105 and OPN. In addition, the consistency of EF staging using CD105 and OPN expression was compared to that using histopathology. RESULTS: The grade of EF was significantly lower in group II than in group I based on the fibroblast count and fibrosis density determined using histopathology, as well as by CD105 expression determined using immunohistochemistry. In contrast, OPN expression was not a reliable marker for EF evaluation because it did not show a significant difference between the two groups.